When I was in college at Holy Angel University, I was forced by my friends to get involved and join this Mr. and Ms. contest thingy for the celebration of our College of Engineering and Architecture (CEA) Week. I was really hesistant at first because I have never joined contests like this. I always freak out in front of the crowd that's why I thought the idea was insane. Then, the president of our organization which happens to by my friend talked to me and convinced me to join. I had no choice, I can't disappoint her, so I said yes. The contest was in line with the Sports fest activity hence, it was called Mr. and Ms. CEA Sportsfest 2006. Part of the segment was we had to model a sports attire and walk the walk. I was really not prepared then because it was already a day away when I finally said yes so I was on a rush. I showed off wearing a golfer attire with a golf club. Also, like any other pageant, there's always this question and answer segment. I think I was second to be asked. I did pretty well and I think I answered the question just to the point. 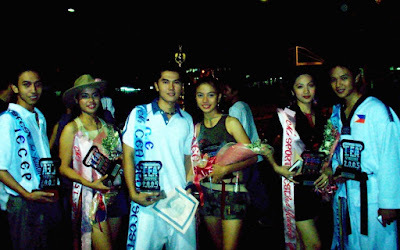 Guess what, I landed second place and got the Mr. CEA Sportsfest 2006 first runner-up title. Not bad for a first timer huh? hehe. See photo. We were even featured on the school publication. I am the guy in the leftmost part of the photo with the IECEP sash.